Bedlington Terriers' 2014-15 skipper Steven Little has re-signed with the Welfare Park club. Bedlington Terriers have ensured that three of their ever present players from the 2014-15 campaign will be remaining with the club for the forthcoming season. Last season’s captain Steven Little, midfielder Liam Davison and defender Keelan Nellis will all be returning. However, forwards Lee Scott and Jordan Nellis have left the club. Little, who picked up the top two awards at Bedlington last season, said: “I am looking forward to the new season quite a bit actually, especially with the players that Andy [Ferrell] has brought in and I’m hoping it is going to be a good season. All three players were ever present in the starting line-up last season, and with the trio putting pen to paper it will give the team a huge boost ahead of the forthcoming campaign. Manager Andy Ferrell said: “To lose our captain would have been a massive blow to the side, he is everything you want from a player in the dressing room and we are pleased he is back on board. “I am also pleased to get young Keelan Nellis back, at times last year he lacked confidence, but I believe in him and that is the reason he has come back, and there will be a big part to play for him next season. 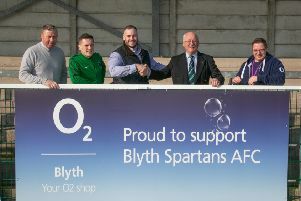 Bedlington’s captain had received offers from other clubs, and throughout the speculation Ferrell expressed his determination to keep his captain with the club. He said: “There has been a few people enquiring, I want the team to be smashing my ambition of finishing high in the league, Andy and Ronan [Liddane] have talked to me and the club is doing something that I want to be part of. The trio will be looking ahead to the opening game of the season against Dunston UTS, but their first challenge will be on Wednesday, July 8, against Red House Farm in the pre-season opener.